Who is your favorito female character? What do you think of Cara Delevingne as the Enchantress? Tell me who ur favorito villain is? Suicide Squad is a DC film that was directed por David Ayer. The film has lots of fans, but the film was highly disliked por critics. I personally think that the film is great. This artigo is about discussing various things that the film did a great job at. Suicide Squad is a 2016 DC film that stars Will Smith, Margot Robbie, and Jared Leto. It has gotten bad critic reviews, but does it deserve that? This review is about that. The Suicide Squad (Task Force X) is founded por Amanda Waller who has sneaky intentions. The team has hit man Deadshot, fun loving Harley Quinn, Flash enemy Captain Boomerang, fogo powered El Diablo, and powerful Killer Croc. They are joined por the military Rick Flag and swords girl Katana. It's up to them to save the world from the Enchantress. They also better watch out for the Joker! SPOILERS for the Extended Cut Special Edition! So DO NOT read on if you don't want to be spoiled for the extended cut or the special edition special features! SO, it's here. 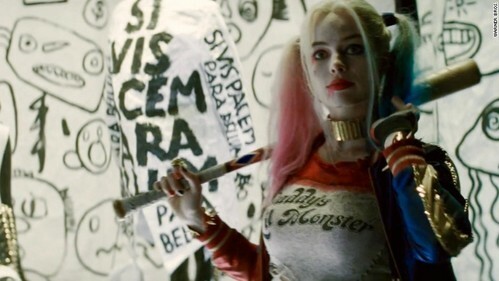 'Suicide Squad' is now available for us nerds to hold in our sweaty, grubby hands. This nerd *points to self* is here to review the crap out of the Extended Cut Special Edition blu-ray release. SPOILERS!!! This is NOT a spoiler-free review! Turn back now if you haven't seen the movie!!! The wait is over! The Skwad is here! So of course that means it is time for me yell my opinions into the internet. I have great many thoughts about 'Suicide Squad' so in order to organise them so others may understand them, I've chopped this review up into a few different sections. Read on, Puddins'! Soooo the link has been released, so I thought I'd do a pre-release guide to the soundtrack, and link you to some of these musical delights. If the song hasn't been released yet, I'll be linking you to another song from the artist as an example of their particular sound. Hopefully I'll be able to update these as all the songs are released! Go Squad Yourself! / Show Me Your Skulls!